I was standing in line waiting to buy kombucha at Green Life, my city’s beloved organic grocery store. The guy in front of me had a few small items. His total came to $14.38. As he pulled out his debit card, the cashier asked, “Would you like to round up to $15 and donate the rest of that money to this month’s charity?” She shared the name of the local organization where the money would go. This local charity idea has been going on for years. Each month the grocery store picks a cause and asks for donations at the check out line. The new strategy intrigued me. Now – regardless of how you feel about the politics of raising money in this way – the lesson here is important to you as a business. People respond to definite calls to action. They respond to CLARITY. 1 – Would you like to donate something to this month’s charity? This question requires first that you make the decision to do it or not to do it. That’s a big decision right there. But then, you also have to decide what amount you want to give. That’s a lot of deciding when you have a long line of people behind you. I mean, hell, is a dollar is too little? Would that make you stingy? Or should it be more like $5? Or does that make you a total pushover who just gives money because you can be guilted into pretty much any cause that’s out there? When given too many choices, people will default to not taking action. It’s just easier to do nothing than it is to make all those decisions. The cashier did the math for you. She didn’t make you wonder whether or not you should feel guilty for only giving 62 cents. She gave you a clear choice. Yes or no. And as it turns out, the results yield a much bigger take for the charity. Well, let’s look at what the typical solo business owner might tell her prospects. Many people think that the reason they aren’t getting clients is because they’re charging too much or because their industry is too tough. But one reason people aren’t calling you is that your call to action stinks! It doesn’t give clear direction. It doesn’t tell people exactly what to do, or when to do it. It just sits out there assuming that if people want to work with you…they know what to do. Well, they might know what to do. But they’ve got a lot of other things on their mind. And it’s just way too easy not to do anything. And if you know that your product or service is a high level for people and will change their lives, essentially what you’re doing is letting them give up on themselves. That’s not only bad business – but it’s bad service. Do NOT go on sale. Instead, get clear. Communicate clearly. And you’ll get results. 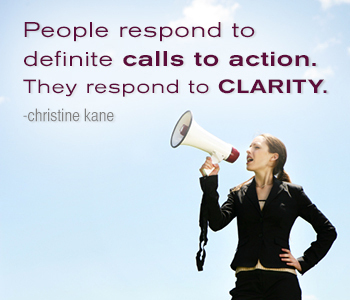 Hey, and leave a comment and tell me how YOU can be more clear in your calls to action! You are so right Christine! I sell custom nursery wall letters on etsy and since reading many of your posts I have doubled my prices and tried to get more clear about what I offer. But I think I still give too many choices. I get a lot of emails from potential clients with questions about how the process works or if I could do this or that for them, and I always get back to them, but often I never hear back from them after that! It’s frustrating. I think maybe I need to give less options and less description about my items and instead just get right to the point about how they can purchase it. OMG! You are correct about that dollar question. That rounding up turns every undecided response into a yes in my head! Wonderful observation. This is what we get when people love what they do, they are always looking out for us. Thank you for reminding me of this. It is actually something I used in the distant past with much success. I would say, when given a compliment by one of my clients, Thank you. If you feel I have truly helped you the biggest compliment you can give me is to refer anyone you feel could benefit from my services” while handing them several of my business cards. They usually would refer someone-eventually. I have forgotten this strategy, however, and can now think of other ways to implement what you’re saying here about call to action. Thank you so so much! Hi Christine, this is great! I think this has been my biggest issue throughout my business, clarity. I do so many different things that I am all over the place. I am a fine artist/fiber artist and teach. I license my art for fabric and products so I deal with the company or agent and I design patterns so I deal with the public and wholesale client. I had a website that had it all on there and last year took it all down. Realizing if I was marketing to everyone I was marketing to no one. I am in the process of separating those different “hats” or businesses in an effort to be more clear for my clients. As I am working through module two and realized that as I was answering the questions I really have several different ideal clients that are facing different challenges. I noticed that I was switching back and forth from the ideal clients when I was answering the questions. I think I need to print out two sets of worksheets and answer for each group. I think that by getting some of those issues clear it will help me address their needs better. This is really challenging as well as eye opening. I need to develop each ideal client profile separately and as I do that work I can focus on that client and their needs. I guess it will be like dealing with my kids, each unique, addressing their individual needs and concerns all while living together as a family! Hi Christine, thanks once again for the wakeup call. One of my biggest problems is not being clear about what I want which leads to not communicating it. So in future I’m not going to give people choices about this or that I’m going to give them the straight cut choice of yes or no. In other words instead of giving people choices of programs it will be “Here is my program I can definitely help you”. Then their decision will only be yes or no. As far as my healing services go I’m the expert so I’ll tell them what they need and in which order then they can decide yes or no. I’m going to start communicating my wants in my private life too. I tell my therapy clients that not asking clearly for what they want is like walking into Taco Bell and, when asked for their food order, saying “I’m hungry.” I guess it’s time to take my own advice, and ask for the “metaphorical Gordita Supreme of business.” With Baja sauce. I think women in general have been trained NOT to be clear, to be subversive, underhanded and unclear to get what they want. So, asking us to be clear in our communications with ourselves and others, and actually give a call to action is undoing years of societal training. Thank you for showing us how to be strong and clear and stand in what we want and not be afraid to ask for it clearly! Roxanne – Why do you think that is? The “funny” thing is that most guys are even worse at picking up subtle hints than women are. So, perhaps we are told to be subtle, unclear, etc., in order to keep us from getting what we want and deserve. And we are also ‘taught’ that stating what we want is selfish and bossy. One guy I work with jokes constantly that I am really really bossy, I ignore it mostly or joke back. I am in the lucky position of being able to ditch him if he gets too annoying. I sense that my attitude here is not the right one. Love it Christine. Clarity is really on my mind lately and this article inspires me to get even more clear. I feel like for me, it’s helpful to pair clarity with confidence. Sometimes I’ve fallen into the habit of being clear, but weak. Like when I reach out to potential affiliates about writing guest blogs or partnering. I have something clear to offer them, but it’s coming from a place of them being above me instead of being equals…like I’m auditioning for them or waiting for a bone. If that feels like a good topic for a blog, I’d love to hear what you have to say. I’m sure you’d have particularly illuminating advice there too. Thanks Christine!! Teri – I can totally understand what you’re saying here. And I think it has a lot to do (obviously) with valuing yourself. I was just sharing with one of my coaches that when someone begins in my Platinum mastermind, the biggest challenge I see them face is VALUING themselves enough to take the right steps for growth – whether that’s upleveling their offer, how they price themselves or even hiring better team members. It’s a process. When I was a musician, I created kind of an “alter ego” for myself who did my booking. And in doing that, i found a really dormant strong side of myself who militantly believed in what I did. And that started the whole thing off for me. I will think on what you’ve written here and consider a blog post or even a video about it! Just know that each time you make an offer, it’s a new chance to grow and learn. Don’t shy away from that – because it’s a big deal! Thank you Christine. Your words come at a great time as I am going through Modules 1 & 2 in UpLevel Your Business. I’ve been stuck with these two things, clarity in my messaging and call to action, for a long time. But I am now seeing a shift and learning the how to’s, thanks to your awesome posts and ULYB course. Thank you so much for sharing your gifts and knowledge. You are most welcome Pam! Can’t wait to meet you in Atlanta! I realize that if I am not clear in my messgae, intention and what I have to offer how can my clients be clear about asking me for what they need to taking action? SO I need to get crazy clear with myself first and then I will communicate with and through clarity to my ideal clients. Its a challenge as I repeatedly have to work through the whole “its ok to get bigger, just NOT TOO BIG” bullsh== BUT I am on my way. Thank you for all the support!!! I have found, since I started working with you, that I’ve applied this clear call to action concept in my personal life too. Especially communicating with my husband. It actually helped me see how much of my frustrations with him have been because I wasn’t being clear about what I wanted. 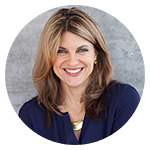 Christina – I always love to hear stories of better communications with partners and spouses because of better clarity in business. It’s so true, isn’t it? Clear communication is really what marketing is all about. And when you look at it that way, and you think of it as service – then you get better in ALL of your relationships! yay!